Butterfly Threads: There's a new Quilt Shop in town!!! There's a new Quilt Shop in town!!! I will give a trunk show, answer questions and have some new quilts to share! I even hear there's going to be cookies...seriously, we are going to have FUN. If you can't wait until the 15th, a few of my quilts are on display and my patterns are available now. To see a map and get directions to City Square Quilts or visit their facebook page. If you plan to be there, RSVP in the comments and I'll bring a little prize for you! Quilts, cookies, prizes...how can you resist? Too far away but I am sure you will be great! I would love to see your quilts in person. Thank you so much Kelly! For some reason your comments aren't making it to my inbox. So either blogger, gmail or the mysteries of the cyber universe are playing tricks again. I'm so sorry if I haven't replied to you. I do hope you are having a wonderful week! HOw fun!!! And now how tempting to buy more pretty stuff! It is a great shop. So fun to see the new stuff she is getting in. I also saw your quilts go up yesterday. They are beautiful.....and I even recognized one as yours. I am so excited to go see the shop and I'm tickled that she wanted to hang my quilts! Can't wait to visit!! I hope to be there. 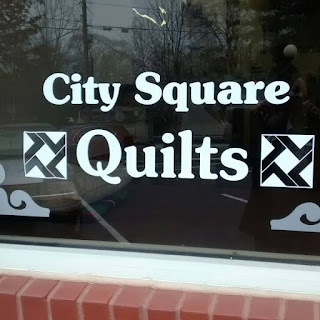 So excited - I just found out about the quilt shop and live minutes away!